Melanoma is an aggressive form of skin cancer, that is most prevalent among men and women in their sixties, but also affects significant groups of young people. It has become one of the most prevalent cancers among women between 25 and 29 years old. The VUB’s Professor Karine Breckpot’s melanoma research has been selected for a grant by the Melanoma Research Alliance (MRA), the largest private funder of melanoma research in the world. The incidence of melanoma has dramatically increased over the past decades and is now higher than most other cancers. The human immune system should theoretically be able to detect melanoma cells and destroy them. That some people develop melanoma skin cancer nonetheless, is due to the fact that melanoma cells can camouflage themselves, thereby avoiding attacks from the immune system. Furthermore melanoma cells manage to exploit so called ‘stimulus inhibiting circuits’ in the cells to slow down or even completely stop the immune system. To curtail these stimulus inhibiting circuits by melanoma cells, scientist have studied the molecular interactions at the basis of these circuits – so called ‘inhibiting immune checkpoints’. Medicines that bind such checkpoints are based on antibodies and are being developed rapidly – and with success. Particularly patients with late stage melanoma appear to benefit from these experimental drugs. The encouraging results have actually led to these medicines being brought on the market. Nevertheless, it is vital that intensive research into inhibiting immune checkpoints is continued. The VUB research honoured by the Melanoma Research Alliance serves as a good example. The researchers have developed a new strategy to use the molecule programmed death-ligand 1 (PD-L1). Their PD-L1 binding antibody stems from camel-like animals and when compared to other, already marketed drugs is a lot smaller, which enables it to penetrate tumors more successfully. Prof. dr. Karine Breckpot is extremely excited about the support from the Melanoma Research Alliance. ‘Today the belief in immune therapy as a strategy to attack cancer cells in a directed way is bigger than ever. Especially the use of antibodies to counteract the negative signals that immune cells receive from cancer cells turns out to be a successful strategy. I am honoured that our team, the Laboratory for Molecular and Cellular Therapy in cooperation with the In-vivo Molecular Imaging team, is granted the trust to develop a truly Belgian and authentic VUB product in this context,’ Breckpot elaborates. In 1995 the International Myeloma Foundation (IMF) started the Brian D. Novis Research Grant program in memory of its co-founder. The IMF awards prizes every year to stimulate research on myeloma and thus improve the chances of patients. To this day, the IMF has supported more than 100 promising projects, including that of Professor Eline Menu and Professor Elke De Bruyne. They received their award in Atlanta during the annual American Society of Hematology (ASH) meeting. Multiple myeloma (MM) is a cancer characterized by uncontrolled growth of plasma cells in the bone marrow. In recent years, enormous progress has been made in the treatment of MM patients, partly due to the development of new drugs. Yet most patients relapse due to the presence of residual cancer cells after an effective first treatment. An important characteristic of multiple myeloma (MM) is the genomic instability, which leads to genetic defects, drug resistance and progression of the cancer. The IMF awarded Professor Elke De Bruyne a Brian D. Novis Research Junior Grant for her research on the role of protein arginine methyltransferase 5 (PRMT5) in MM biology, genomic instability and drug response. Another cause of relapse is the interaction between the MM cells and the bone marrow environment in which they nest. 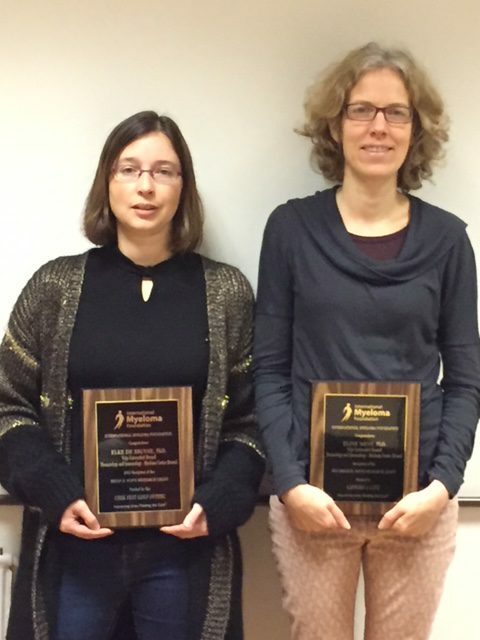 Professor Eline Menu received a Brian D. Novis Senior Award for her research into the metabolic interaction between the MM cells and their environment. 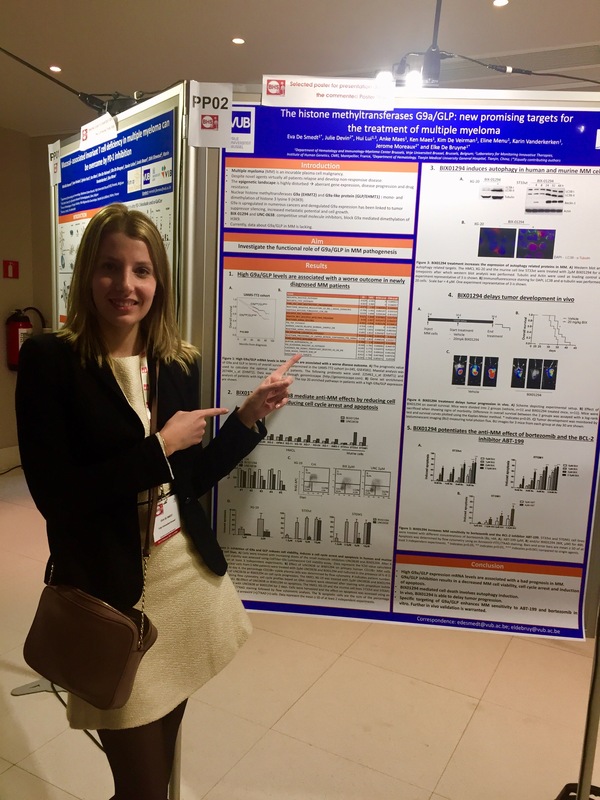 During the last BHS meeting, Eva de Smedt has received an award for her poster presentation “The histone methyltransferases G9A / GLP: new promising targets for the treatment of multiple myeloma “. Eva De Smedt is a PhD student in the laboratory Hematology and Immunology (HEIM) at the Faculty of Medicine and Pharmacy under promotership of Prof. Karin Vanderkerken en Prof. Elke De Bruyne.